I'm sorry Tough Armor, but if there's anything else that I like more than a good Spigen case, it's a case made by company called Magpul. 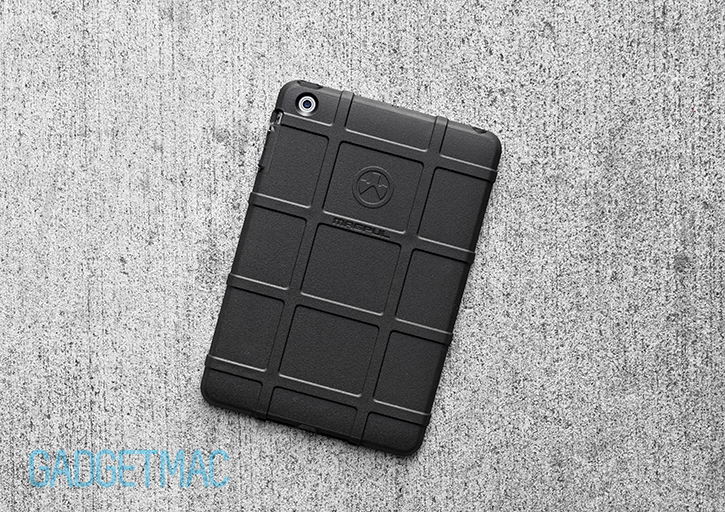 More specifically, Magpul's new Field Case for the iPad mini. And although it lacks a tiny cutout for the rear-facing noise-canceling mic, the Field Case case also fits Apple's newer Retina iPad mini 2 tablet. 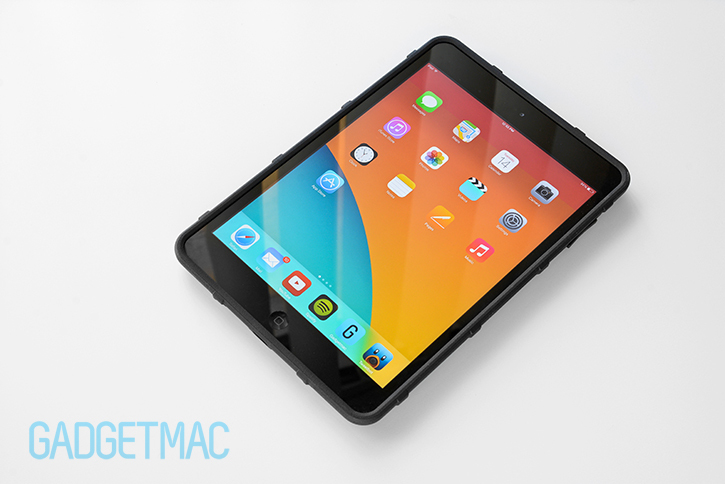 We should note that Magpul has told us that it will be releasing an updated version of the Field Case for the Retina iPad mini that will have this little cutout for its rear-facing mic very soon. Naturally beloved by military personnel and enthusiasts if all-things tactical, the Field Case is one of the more sought after cases for iOS devices, and finally now also Android smartphones. Now that Magpul released a version for the iPad mini, it only would be fitting to reconsider that non-tactical case you may or may not have on your tablet as of this moment. Unsurprisingly, you get exactly the same great Field Case experience that you do with Magpul's smartphone cases, only at a bigger scale. Available in a slew of colors, the Field Case for the iPad mini is priced at $27. And like all Magpul accessories, it is made in the USA. In case you were wondering, the Field Case shares the same style of design with Magpul's popular PMAG weapon magazines that are designed to offer unprecedented crucial traction and grip for flawless operation with or without tactical gloves - which is what inspired the tremendously grippy surface and ribbed pattern featured on the Field Case for the iPhone and now the iPad mini. The Field Case for the iPad mini features the same semi-rigid, snap-on design and construction as other Field Case offerings which fits and hugs the iPad mini as if it were a latex glove. It fits flawlessly in such a way that it kind of feels like it becomes one with the device in that there's no give or flex whatsoever. The fit is solid as a rock and that's one of the great aspects about Magpul's arguably innovative design. The amount of grip being provided by the Field Case is borderline insane. I'd go as far as saying it's as grippy as rough sand paper, but that just comes out as seeming like an uncomfortable thing to be holding. Magpul's expertise in manufacturing some of the most popular tactical accessories certainly transferred over to its iPhone and iPad cases in a big way. The textured TPU rubber seems to me like some type of proprietary granular texture I've yet to see on a case of this kind. Note that Magpul designed the Field Case for the iPad mini and not the Retina iPad mini which explains the omitted rear noise-canceling microphone cutout. To be perfectly fair however, there's no issue with shooting video and recording perfectly clear audio using the Retina iPad mini whilst encased inside the Field Case. We found absolutely no issues with the fit moving between the original iPad mini and Retina iPad mini using the Field Case. The fit is perfect on both tablets with no play whatsoever in the material of the case. The texture and the slim profile of the new Field Case define exactly why it's an amazing case to use even if you could care less about tactical gear and the whole industry behind it. You have to feel it to believe it, and understand why we're raving about it so much. Because photos and a few words can't express the sensational feeling of using the iPad mini Field Case. The side ribbing, slim yet protective profile and that extremely grippy durable material makes the Field Case a pleasure to use and hold more than ever before. One of the small details that come with the Field Case's unique textured polymer is that lint and fingerprints fear it even if you pick up a black colored Field Case. Magpul's Field Case is purposely designed to have a low profile so that it won't interfere with how you use your iPad mini whilst still featuring a minimal, and well rounded lay-on-the-table designed rim along the edge. And while I do think Spigen's Tough Armor case is a great relatively slim rugged protective case with a similar price tag, the Field Case by comparison is slightly slimmer, more refined with its form-fitting and a whole lot more agile to hold. It doesn't feel nearly as bulky and heavy as the Tough Armor, and that's appreciated especially when the iPad mini is a pretty large device that you'd like to hold with little effort. And I must say that while I thought that it couldn't get any better than the Field Case for the iPhone 5s and iPhone 5, I'm happy to have been proved wrong as Magpul managed to amaze me even more with this iPad mini variant. And that may be because it's such a different form factor, yet I also think is due to the fact that Magpul has created a flawless case this time around. And I really do mean perfect. Field Case and Bump Case owners will be happy to know that the iPad mini Field Case completely sits flush as it borders the bezel. The interior design is quite different from the iPhone version in that it's designed to overlap the edges of the iPad mini in such a way that it grips the periphery snugly creating this amazing fit without enabling you to pull away the edges if you put pressure on the edge of the case when holding the device with one hand. It's worth noting that unlike the Field Case and Bump Case for the iPhone, the Field Case for the iPad mini isn't very screen protector-friendly. Because of its incredibly tight tolerances and outstanding, precise fit - the Field Case will not fit as well if you have a tempered glass screen protector installed. As for plastic screen protectors, the corner edges will mostly likely bubble up from the case tightly overlapping the bezel of the iPad. It's worth a shot however if you do happen to have a screen protector waiting to be installed. Make sure that it isn't thick or cut to fit the screen all the way up to the edge of the glass. The Field Case features uniquely designed integrated volume and sleep/wake buttons which compliment the grip-enthused styling, and offer superb tactile feedback when pressed. Reaching the orientation lock switch right above is easily done. Cutouts for the iPad mini's 3.5mm audio and Lightning connector ports are designed to support the Field Case's form-fitting rigid construction without impeding on the functionality of using the controls and ports of the iPad. You'll be able to easily plug in any modern 3.5mm audio jack, however, there are obvious limitations as to which type of additional accessories you might be able to use with this case on. We haven't seen a case that can accommodate large adapters without sacrificing its rigidity support around the bottom end of the case where usual flexing or sagging of the case would otherwise occur. With this rigid individual cutout design, the Field Case is able to keep a firm purchase around the perimeter of the iPad without unwanted outward material bending. If you drop your iPad mini inside this case, there's a pretty good chance that it'll be safe from a waist height drop because of the Field Case's shock-absorbing polymer and ribbed design. I wouldn't recommend it as a tough drop-protective case or an alternative to Spigen's Tough Armor case, but instead as a very protective case that'll keep your iPad mini safe from an occasional mild drop, scuffs and scratches without imposing any bulk whatsoever. Magpul's Field Case is by far and away the best TPU rubber case I have ever used for the iPad mini, and I've got a good feeling that it will continue to hold this title for a long time to come. You'll be hard pressed to find a similar case that'll offer you as much good-feel grip with such a low profile and overall quality at reasonably price. So much so that I feel like the word "TPU" gives the Field Case a bad rap only because that type of material was given a bad name by cheap cases often times associated with low quality. But the reality is, Magpul's TPU material is unlike any other as we've said before. It has an unbelievably amazing texture and rigid quality to it that it almost feels like a composite of some kind. A composite of awesomeness most likely. If you love a grippy case that fits as if it was meant to be, the Field Case for the iPad mini is the only case I know of that can achieve an amazing type of grip that's like a new rubber tire melted down on the track by an F1 car. It's that grippy. There's no faulting it even if it lacks one mic opening, which doesn't negatively affect the performance of the Retina iPad mini as far as we're concerned. The slim form factor and lightweight material makes the Field Case case for the iPad mini one of the best cases money can buy for all around general usage. We not only highly recommend it, we think it's a must have iPad mini case. Magpul needs to get on making an iPad Air Field Case pronto. You may be asking yourself how the heck did this case get a rare perfect score? The answer is quite simple, it is perfect. Well, at least we think is it and we’ve tried a bunch of iPad cases. But that’s not all, because we also think the Field Case for the iPad mini and Retina iPad mini tablets is one of the best cases of all time, it easily wins our Editors' Choice Award.